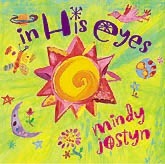 Mindy Jostyn: About "in His eyes"
In His eyes is an inspirational collection of 16 non-denominational folk hymns. A listener writes, "The beauty of her interpretations of the hymns reveals an astonishing gift for bringing out the deep spirituality of her music." 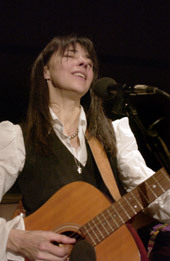 After a sideman career of touring and recording with numerous artists like Billy Joel, John Mellencamp and Carly Simon, Mindy brings her strong professional background and a wide range of styles (Celtic, blues, folk and gospel) to this collection. The mix of hymns, some familiar, some adaptations, some original, have been delighting and uplifting listeners of all ages. 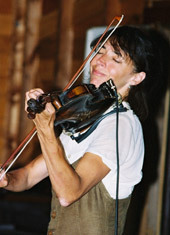 All the songs on "in His eyes" feature Mindy's expressive vocals and her command of violin, accordion, keyboard, guitar and harmonica. The opening cut, "Morning Song," provides a Celtic-influenced introduction, praising the dawn of a new day. In "Brays," the haunting tones of a melancholy accordion bring a kind of old-world, down-to-earth passion to this poignant and familiar story. "Love Never Fails," with its lyric based on an adaptation of1st Corinthians13, is both intimate and personal as well as deeply moving. It offers a quiet contrast to the upbeat "I Walk with Love," with a lively jazz saxophone and jubilant vocal harmonies. "You Can't Stand Up Alone" is an a cappella rendition of a gospel tune delivered in rousing three part harmony. "Love One Another" features a stark vocal accompanied only by a rhythmic harmonica. A soulful blend of accordion and guitar underscores the gentle vocal in the plaintive Irish melody of "O Dreamer." "The Pool of Bethesda," an ancient story sung from the point of view of a Jerusalem sheep trader, swells and subsides in sync with the words of this intense drama.. The title track, "In His Eyes," is a healing message of God's abundant love for man, with a simple violin and guitar accompaniment that allow the words to ring through clearly. Joining Mindy on "in His eyes" is Cornelius Bumpus, (Doobie Brothers, Steely Dan) on saxophone and vocals, and Catherine Russell (Cyndi Lauper, Steely Dan) on vocals. Other musicians include bassist Paul Adamy, Israeli percussionist Gilad and guitarist Matt Balitsaris, who co-produced the record with Mindy. "in His eyes" is the first release from Mindy's new label, Moonboy Records. "[The] self-released gem . . . is a refreshing musical tour-de-force that uplifts the soul as it reaffirms this talented young lady's versatility." Read the whole story: "Album Takes Jostyn in New Direction". "It is beautiful, and very much a message we are into -- not anybody's dogma, but the real heart of it all." "I've played the CD for my Sunday School class of teenagers. So many times, I have played a song or two for someone who needed healing. People love your music, no matter what age or religion." "in His eyes is magnificent. The songs, timeless, yet completely fresh, form a seamless, deeply satisfying whole." 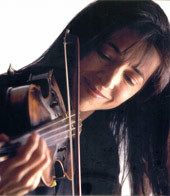 "The music is both inspired and inspiring, reflecting truth, beauty and goodness, i.e., God. This CD synergistically uplifts the frequency of the human condition each time it's heard and nudges our evolution in a positive, loving and elevated direction." "I use music to give my architecture studio a creative, enriching surround. in His eyes is among the most satisfying CDs for that. No matter what type of song, a quality comes through that fills my studio with artistry and encouragement." "Our 3 year old has requested to have the CD played every night as she lies in her bed. Every other song she says, "This is my favorite one," and she is singing along with some of the lyrics." "Your music and lyrics are truly a gift. Every song is unique and heartfelt." "It is absolutely beautiful! My husband and I are playing it over and over again. I can tell you it is one of our all time favorites." "I wasn't sure what to expect from an album of hymns and so I was pleasantly surprised by how enjoyable and fresh the songs were."